The NRA is holding its national convention in Houston this weekend. Last night they had right-wing rocker Ted Nugent kick things off by playing the National Anthem on his electric guitar ala Jimi Hendrix. Gov. Rick Perry gave the introductory address on Friday and House Majority Leader Tom DeLay was the keynote speaker on Saturday. These are good times for the NRA - the undisputed heavyweight of political advocacy groups. They have outspent their biggest political rival - Brady Handgun Control - by something like 17 to 1 and the results are obvious. The GOP - which acts like a subsidiary of the NRA - controls every branch of the federal government. Despite polls showing widespread support for the assault weapons ban, Congress let the law lapse rather than risk the wrath of the gun lobby. I don't have a problem with gun nuts in general (and I use that term endearingly since I am related to a number of self-described gun nuts). But no one I know is as extreme as the current leadership of the NRA. Wayne LaPierre, who coined the term "jack-booted thugs" to describe federal agents, is a certifiable lunatic and the extreme positions he has led the NRA to take over the years has made this country more dangerous. Opposition to the assault weapons ban is just one of many outrageous positions the NRA has taken in recent years. They have also opposed laws limiting the sale of armor-piercing, cop-killer bullets as well as laws banning the sale of plastic guns which can slip by security screens in airports. The NRA today is a lot like the Christian Coalition in that it would appear to be representing a large segment of our population, but is driven according to an agenda set by a small group of extremists on the far-right fringe. I hope that one day soon some level-headed people will regain control of this organization and restore its tarnished credibility. Until then, I can't see much difference between the NRA and the nutjobs who run these militia groups. Only the NRA is scarier because it has the leadership of our country in its hip pocket. We finally have something that Mark Harden and I can agree on. finally make its way through the Senate. By giving jurors the option of life without parole, there will be less reason for them to hand out death sentences, which I oppose on moral and philosophical grounds. As I noted last week, an earlier version of this bill fell through because Republican senators feared that it would undermine support for the death penalty. But this time the bill’s sponsor, Sen. Eddie Lucio Jr., D-Brownsville, struck a compromise with with Sen. Steve Ogden, R-Bryan, that cleared the way for its passage. Unfortunately, the compromise meant eliminating the option of life with the possibility of parole after 40 years, thus further tying the hands of juries in capital cases. Apparently it all boils down to a matter of trust. Sen. Lucio says he trusts Texas jurors. “I think the more options juries have, the better," Lucio said. "I trust Texas jurors." Sen. Ogden thinks they are morons. Ogden said giving jurors three possible sentences to choose between might confuse them and open the door to additional appeals from inmates. Having three options to choose from is just sooooo confusing for those poor ignorant Texas jurors. I’m so glad Sen. Ogden is looking out for them by limiting their options to just two. In fact, maybe we should just make it even simpler and give them just one option. Then we could eliminate the hassle of having juries in the first place. I will be guest blogging for the next few days at S.A. Express-News Watch while the Alamo City Commando is off on a top secret aquatic reconnaissance and requisition mission. I hope I don’t run off too many of his loyal readers with my liberal rants. In the meantime, I was happy to see that the Texas Observer has launched a blog called Texas Legislature Observed Blog. Also, State Rep. Aaron Pena, D-McAllen, who does the A CAPITOL BLOG, has now launched LONE STAR RISING which will serve a blogging outlet for other Texas state legislators. Seems like this blogging fad is proving to be more durable than many folks thought a couple of years ago. The spineless Bush administration has caved on its plan to cut farm program subsidies. Bush asked Congress in February to slash billions of dollars from payments to large farm operations, dropping the maximum farmers are allowed to collect from $360,000 to $250,000 and closing loopholes allowing some growers to obtain millions of dollars. He also proposed to cut all farm payments by 5 percent. The problem with farm subsidies is that the bulk of the money goes to a handful of huge agri-business corporations - not small independent farmers. Agriculture Secretary Mike Johanns has argued that bigger operations collect too big a share of government payments. According to his department, 8 percent of producers receive 78 percent of subsidies. The scary think now is that while Bush has wimped out on reducing the flow of federal dollars to these large farming conglomerates (which contribute heavily to Republican political causes), he is still requiring big cuts from the Agriculture Department. Bush's proposed cuts would total $8 billion over 10 years, as calculated by the nonpartisan Congressional Budget Office. Last month, House budget writers cut Agriculture Department spending for 2006 by $5.3 billion, while their Senate counterparts cut it by $2.8 billion. On Tuesday, Johanns told key senators that while spending must be reduced to hold down the federal deficit, he is willing to look elsewhere in agriculture programs for cuts. If the cuts don’t come from subsidy payments to corporate farming operations, where will they come from. Oh, yes. The story addresses that too. If cuts don't come from payments to farmers, they still must come from somewhere. Republican committee chairmen have suggested reductions in spending on land conservation and nutrition programs, such as food stamps, also run by the Agriculture Department. They will just cut funding for land conservation and food stamps! Suddenly, the Bush administration finds its spine when it comes to taking money away from poor hungry children and environmental conservation programs. I suppose this story was inevitable. 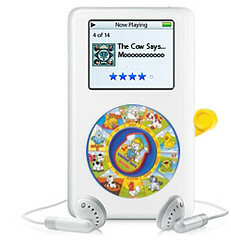 We now know what tunes President Bush likes to listen to on his new iPod. What does it say about the president when we analyze a random list of the songs programmed into his digital juke box? Nothing really. But we like to read about it anyway. John Hiatt - "Circle Back"
Joni Mitchell "(You're So Square) Baby I Don't Care"
The Gourds - "El Paso"
Blackie and the Rodeo Kings - "Swinging From the Chains of Love"
Stevie Ray Vaughn - "The House is Rockin'"
James McMurtry - "Valley Road"
The Thrills - "Say It Ain't So"
I'll just say first that it's doubtful Bush actually picked all these songs himself. The story notes that the job of loading songs onto his iPod fell to a staffer who probably picks stuff he thinks the boss will like. Second, you can bet this list was perused by Bush's handlers before it was passed out to the media. And the bit about "My Sharona" being a dirty song is silly. I've listened to that song all my life and never gave it a second thought. What good rock song isn't dirty at some level? Overall I find the list a bit boring. But mostly I'm just jealous because I don't have an iPod. All rhetoric to the contrary, the Senate actually does approve some federal judges. At 5 p.m. today, the Senate is scheduled to begin considering the nomination of Paul A. Crotty to be U.S. district judge for the Southern District of New York. Democrats predict he will be approved by a wide margin and with the support of both New York senators, Democrats Charles E. Schumer and Hillary Rodham Clinton. Crotty's nomination has been pending awhile. Democrats complain that Republicans are purposely not sending consensus judges to the Senate floor so that the confirmation rate doesn't increase. After Crotty's presumed approval today, the tally will be 205 judges confirmed since Bush was elected in 2000, with 10 not confirmed. "They wanted to have just the bad judges on the floor to make us look obstructionist and let pressure mount toward a nuclear showdown," one senior Democratic Senate aide said. When Bill Clinton was in office, Republicans blocked 61 of his judicial nominees from coming up for a vote. Now these same hypocritical Republicans are threatening to change Senate rules to keep Democrats from filibustering any of Bush’s nominees all because they have blocked 10 of his picks. Note: Republicans have already changed a number of Senate rules that they used when they were in the minority to block Clinton nominees - thus leaving Democrats with only the filibuster to block any Bush nominees they object to. The Wall Street Journal has an interesting article today (4/12/05 A4) about the Republicans threat to use the “nuclear option” the next time Democrats try to filibuster one of Bush’s judicial nominees. The story essentially points out that Majority Leader Bill Frist doesn’t have the votes to back up his threat because moderate Republicans like Lincoln Chafee, Olypia Snowe, Susan Collins and Chuck Hagel are either wavering or opposed. Meanwhile, even some conservatives like John McCain and John Warner are warning against taking such drastic steps. President Bush has largely ignored the tradition of consulting with home-state senators before settling on judicial nominees. This ticks me off because when Bill Clinton was in office he did follow this tradition and as a result nominated a number of judges who were hand-picked by Republicans like Orrin Hatch and Trent Lott. Senators Orrin Hatch and Trent Lott each suggested candidates for district court seats in their home states; Hatch pushed strongly for the nomination of Ted Stewart in Utah, and Lott recommended Allen Pepper in Mississippi. Despite concerns expressed by civil rights and environmental groups, both Stewart and Pepper were nominated by President Clinton and quickly confirmed. So, ironically, we have a lot of very conservative judges out there right now who are “Clinton-nominees” because President Clinton respected the tradition that Bush is now thumbing his nose at.